The UCLA Bruin basketball team stepped onto Nell and John Wooden Court in Pauley Pavilion donning their new gold "C" uniforms to meet the media Tuesday afternoon. The special designation on the uniform represents the university's achievement of becoming the first athletic program to win 100 NCAA championships. UCLA Head Coach Ben Howland welcomed the media and began his interview, as he has the past few years, proclaiming his team would go as far as its health would allow it. "We have a very experienced team coming back," Howland said. "Provided we stay healthy, we have a chance to have a great year." The Bruins begin the 2007-08 campaign with only eleven scholarship players on the roster due to the unexpected departures of Arron Afflalo to the NBA and transfer of Ryan Wright. A collegiate team is allowed thirteen total scholarships. Already the team has suffered a bevy of injuries from over the summer. Sophomore James Keefe injured his shoulder in a pick-game earlier this summer which required surgery. His recovery is ahead of schedule at this point and he may return in mid-December in time to play against Idaho St. Keefe will begin polymetric exercises next week. Two weeks ago Lorenzo Mata-Real suffered a sprained foot when he stepped on a player's shoe during a pick-up game. Mata-Real is expected to begin light basketball drills this Friday for the first time since the injury and is expected to be ready for the preseason opener. Forward Nikola Dragovic, unknown to Howland at the time, had double-hernia surgery over the summer while he was back in Serbia. Dragovic is fully healed and should be ready to play by the start of the season. Red-shirt junior Josh Shipp has been recuperating from offseason hip surgery. Howland stated he was very pleased with Shipp's individual workout yesterday and expects him to be at full strength by the start of the season. As for incoming players to the program, the Bruins are adding freshmen Kevin Love and Chace Stanback. Kevin Love, whose arrival to Westwood has been one of the most highly anticipated in some time, should have an immediate impact this season. However when asked if Love would begin the season in the starting line-up, Howland would not commit to the move just yet. "Right now my starters are Darren, Josh, Luc, and Lorenzo." Howland said referring to his returning starters from last season. "A number of players will be vying for the last spot." Although realistically, it would be difficult to fathom Love not in the starting line-up at the start of the season. The 6'9 Love provides the Bruins an immediate upgrade in the low post and his rebounding and outlet passing should immediately change the complexion of the team on both ends of the court. Among the other returning players, Howland is extremely positive on the offseason development of sophomore Russell Westbrook. While he expects Westbrook to play minutes backing-up Darren Collison at point-guard, he also says Westbrook will play the two-guard alongside Collison at times during the course of the game. "Russell may have made more improvement than any other player in the program this offseason," Howland said. "He is really strong, very athletic and explosive , more so than he was a year ago. On defense, no one should be able to get by Russell, he is so much stronger now and actually grew some over the summer." Howland said his team's primary focus is to win the Pac-10 this year and then let the chips fall as they may thereafter. "The Pac-10 is by far the best conference in the country," Howland said. "Winning the Pac-10 is so important because it gives you the best chance to get back to the Final Four since it allows you to play close to home during the early games of the tournament." The Bruins begin team practices on Friday night. The first game of the season is a preseason contest against Azusa Pacific on November 2. Wow - the yellow "C" looks really bad. I'm glad to hear that they're going back to the drawing board on this one. But man, is it good to start getting into a new hoops season! This team is going to be a lot of fun to watch. The "C" does look bad...it disappears into the white uniform..probably looks better on the away jerseys. I'm jazzed about the season. Russell Westbrook sounds like he's going to have a breakout year! I hope we never wear those jerseys. What are we USC?? Rubbing it into everyone's faces that we hit 100 titles first?? Those jerseys need to go! The cartoon jerseys need to go!! Anybody know if there is some sort of midnight madness open to the public on friday evening. No midnight madness - at least for the public. The Bruin team will actually be practicing late Friday night through midnight at Pauley; however, the practices will not be open to the public or media. Is the first game against Azusa going to be televised? I like the jerseys! And why not remind everybody we got to 100 first? Plus most Trojan fans won't understand what the "C" means anyway. The preseason games versus Azusa and Chico State are not televised, however, you can watch them on CSTV via the internet. Its a small screen on the computer and since CSTV utilizes the camera normally used for the scoreboard at the arena, the camera cuts away from the action at times to show highlights of just completed plays. A bit annoying, but its well worth the nine or ten dollars CSTV charges to watch your team. Thank God for Bruin BBall! Our Football season is going HORRIBLE! Hope that changes with a new head coach! 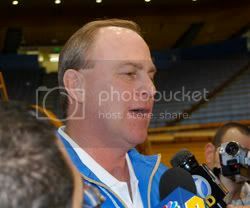 Does Ben Howland have a twin brother who coaches football? Go Bruins!! !